I hope I don’t get to sappy on this post, but I’ve got to let you know that I am so proud of my little yard bordered by gardens, what a difference a year makes. Not that I expect you to remember but here is a photo of what my yard looked like at the beginning of last spring. It was a total mess, pee stained grass, rock “gardens”, and no sign of a proper flower bed anywhere. 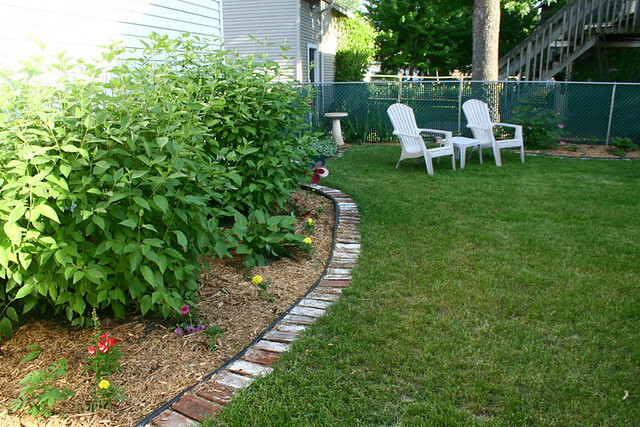 Nowadays it spends it’s time as an actual yard and garden with green grass and perennial flower beds. I have to say I am pretty proud of how it’s coming along, especially because I was able to turn it from nothing into something. I spent many days last summer tearing up the yard, adding borders, stock piling bricks, and collecting plants and I didn’t feel like I had won until the first few days of spring this year when I was able to see all my hardwork come to life again. By no means is this yard a finished project, I still have so many things I would like to add to it and change, but I do feel like I have a good base to expand on over the coming years. The biggest item on my to-do list is to fill in the blanks, I have some big old naked spots in my gardens that need plants stat. 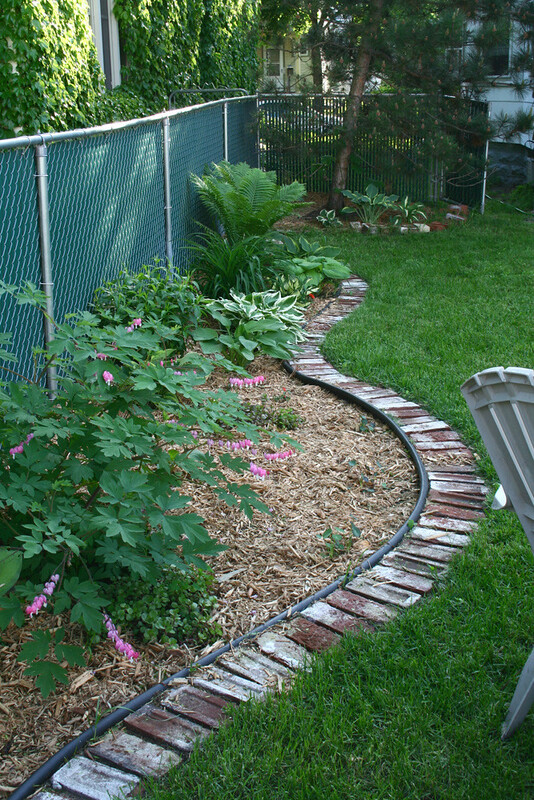 My big dreamy projects are to replace the green chain link fence with a nice wooden fence and to add a bigger paver patio or deck off the back of the house. I think it goes without saying that the thing I love most about my little gardens are my plants, I have collected many of them from friends and family, and I am enjoying knowing all of their stories and remembering where they have come from and what they have grown into (see I told you it might get sappy.) 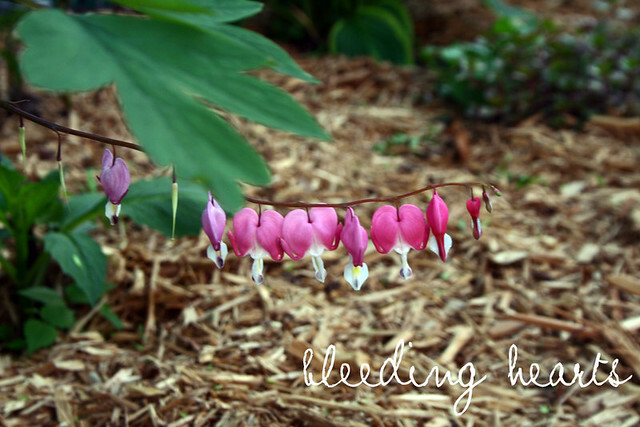 These bleeding hearts are from my mom’s yard and they are thriving this year. 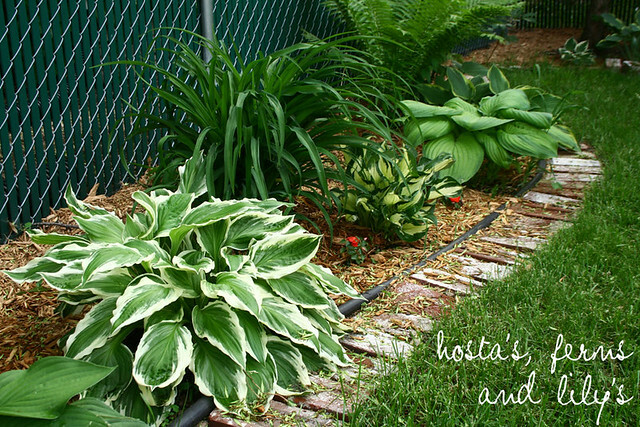 I have two sides of my yard, a sunny side and a shady side, this of course is the shady side and makes itself home to many different kinds of hostas, lily’s flocks and ferns. This is probably the best looking area in my garden. 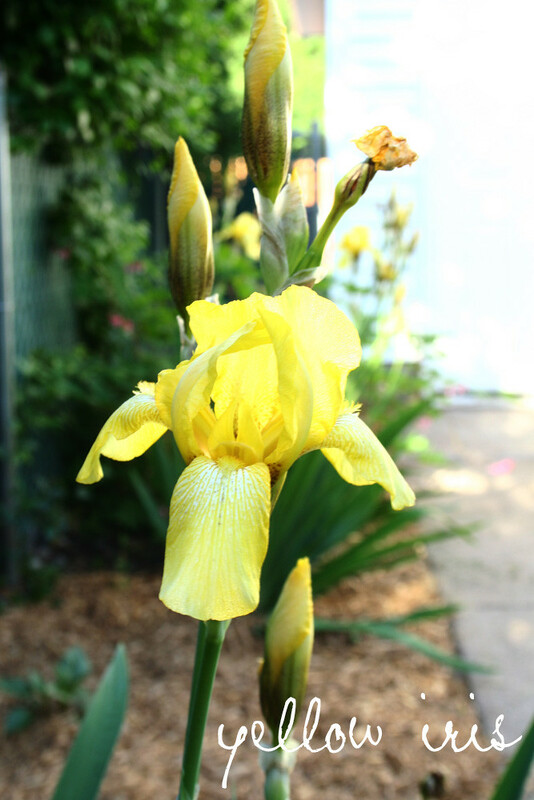 Here’s another spring bloom, this yellow Iris was part of a whole slew of plants I got from my Grandma’s gardens. 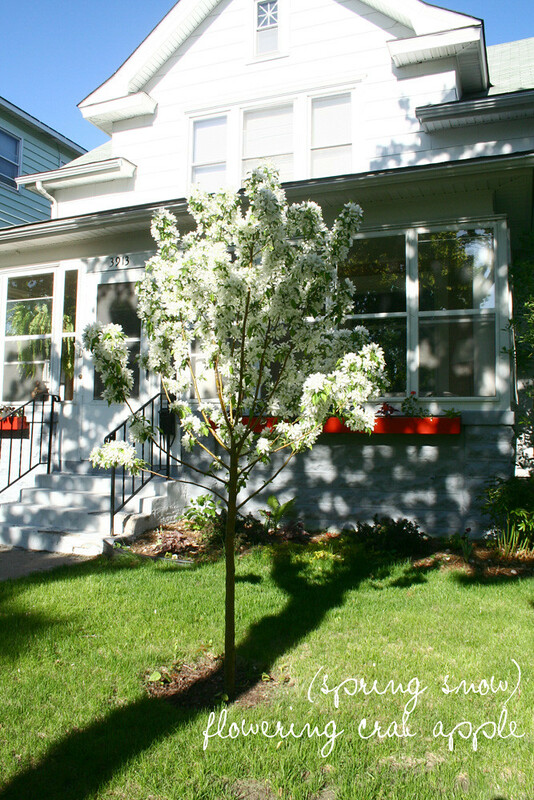 And lastly, here is the front yard, also doing very well with the foundation garden and the Spring Snow Crab Apple tree we planted last year. I can proudly say that I no longer have one of the ugliest houses on the block! It looks great! Just yesterday I was dreaming about what kind of plants I would like to have in my future backyard. I like your idea of having plants from relatives' gardens.